Last weekend started off as soon as 5PM hit on Friday. It's been an extra crazy, and stressful, time at work lately. So, a margarita was just what I needed. Cozumel in Independence has my favorite Chiles Rellenos (now called Chiles Poblano there), and trust me, I've tried quite a few around town. On Saturday, I was supposed to head out east with a friend to tour the wineries and have a picnic. The weather had other plans for us, so we headed to the Cleveland Museum of Art instead. That included brunch at Provenance first. We both started with a Pro Bloody Mary ($13) that has a signature blend, Thirsty Dog stout, garnish, and bacon. Mmmm, bacon. I had the Crab Cake Sandwich ($15). It was quite large and had a side of potatoes, so I took the top off the bun and then it was just right for me. I also left most of the potatoes behind, simply because it was a lot of food. It was a substantial portion for the price. Then we burned off a few of those calories wandering around the museum. This view always makes me stop and pause. How lucky is Cleveland that most of the areas of CMA are totally free and open to the public? Sunday brought us cheese. As in, making our own mozzarella at home. Turned out pretty well! This time of year, I crave a Caprese Salad. Sunday also finally brought Summer Smorgasbord street fest from the Old Brooklyn Community Development Corporation. 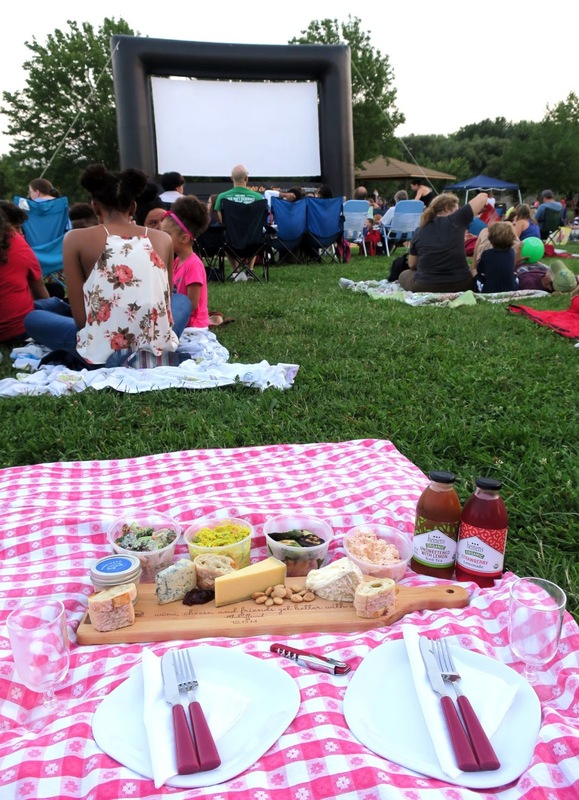 A portion of Pearl Road and Memphis Avenue were shut down from 5PM - Midnight for food trucks and vendors, Kids Zone activities, a stage with live music, a beer garden, wine from the new Vino Veritas Cellar, and a movie showing at dusk. ...and beers from Sibling Revelry in between. We ran into neighbors and friends, and did it all within biking distance of our house. This will become an annual event now, and personally I already can't wait until next year. Monday morning came a little sooner than I had hoped, but it was a darn fun weekend so no complaints! 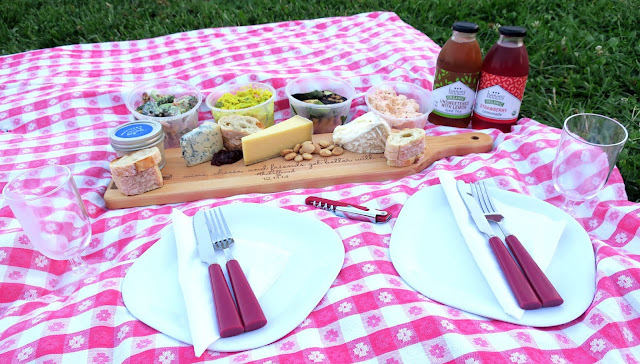 In partnership with Heinen's Grocery Store, Mr. H and I got to pack a picnic dinner to take up to the Cleveland Summer Cinema showing of La La Land in Old Brooklyn last week. It was also a good excuse to use the checkered tablecloth my mom made for my grandma 30+ years ago. It was handed down to me last summer, and I have so many memories of family dinners in the summer at the picnic table using this cloth. Every good picnic includes a cheese board! 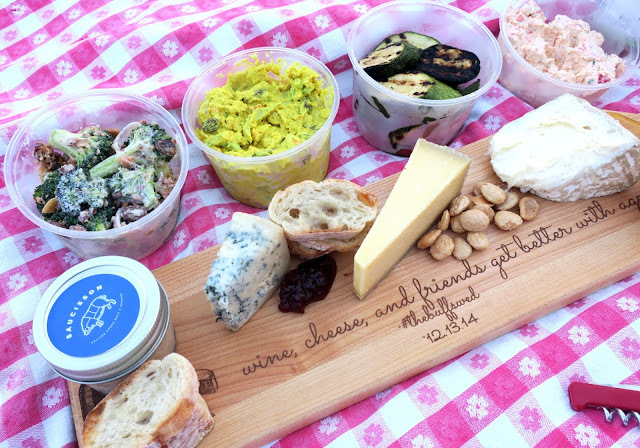 Check ours out, including some fabulous cheeses from Heinen's and the gorgeous personalized board that Crystal got us as a wedding gift. Heinen's has one of the best cheese selections in Northeast Ohio. We added in some marcona almonds, baguette, honey, jam, and a smoked pork rillettes that we got from Saucisson. The prepared foods sections of Heinen's always have some great grab-and-go items. We choose to stick to the cold foods, since we'd be dining al fresco. Our selections included Broccoli Salad, Curry Chicken Salad (one of my long-time favorites of theirs), Roasted Squash and Red Peppers, and Cajun Crab Dip. We settled in for the movie, and had a great time taking in a flick under the stars. This Tuesday's movie at Loew Park is Ratatouille and next week is Sing. It was a perfect evening, and one that we'll be replicating this summer. Check out #SummerwithHeinens on social media to see what others are up to, and pack your own picnic. We're always on the hunt for a good park to picnic in. What's your favorite local spot? Disclosure: I was provided with a gift card in exchange for this post. All opinions stated are 100% my own. This Sunday (July 23rd), the Old Brooklyn Community Development Corporation is bringing the Summer Smorgasbord, presented by Jack Frost Donuts, street festival to the corner of Pearl and Broadview. From 5:00PM until midnight, the streets will be closed and attendees can enjoy live music from five bands, a Sibling Revelry beer garden, wine from the newly opened Vino Veritas Winery in Old Brooklyn, food from 10 vendors and food trucks, and a showing of Guardians of the Galaxy at dusk. It's going to be one big giant block party! It is free to attend, and there will also be family-friendly activities hosted by the Old Brooklyn Families Group going on. Personally, I'm looking forward to taking a turn at the dunk tank to try and dunk some of my neighbors. Come check it out this Sunday! This Monday feels a little tougher than usual, because the weekend was so great and it felt very long and relaxed. It started off well on Friday when I received my recent Bombay Taxi Boutique Jewelry purchases in the mail! If you haven't checked out the online shop, or pop-up events around town, please visit this fellow Clevelander's site. Friday marked 10 years (to-the-day) that Mr. H and I met in that crazy bar on Put-in-Bay. I can honestly say that from day one, I knew he was different and that what we had was different than any other relationship I'd been in. But, what a fast, and fun, first decade together we've had. Better than I could have even hoped for, including the tougher times. That's when I knew without a doubt that he's the one for me. We "celebrated" by renting a boat from Great Lakes Water Sports in The Flats. We spent two hours enjoying the water, sun, and incredible views of Cleveland. Watching the bridges and freighters that up close and personal is quite fun! On Saturday, we headed out to do some local grocery shopping. Including stops at Saucisson, and Ohio City Provisions. The summer produce was exploding off the shelves at Ohio City Provisions, and we took home quite a haul, like cherries, garlic scapes, peaches, greens, sweet corn, onion, and broccoli. I have a confession. My black thumb killed the rubber tree plant I purchased from Lakewood Plant Company several months ago. So, we headed back there on Saturday afternoon to try again. This time, I purchased a cane tree. Fingers crossed. But, I'm obsessed with this little plant store, and you should go check it out if you haven't yet. They also now have a stand at the West Side Market! Sunday brought the area's largest food festival, the Taste of Tremont. While many Clevelanders choose to avoid the crowded streets, heat (Why is it always on the hottest day of summer?!) and long lines, Mr. H and I have perfected a plan of attack that works well for us. We bike in, avoiding the traffic and high parking prices. We start at one end, and make our way down by viewing all of the stands' menus. Then, I make a couple of selections, and stop there on our way back down the street. This year, that included Ushabu (new to Tremont) for some pork belly and a coconut. We enjoyed watching the guys from Fresh Fork Market and Ohio City Provisions serving up a mouth-watering pig roast platter. 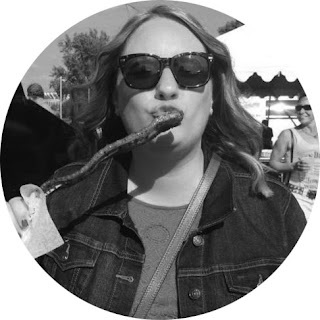 You know I love meat on a stick, so of course the skewers from Ty Fun caught my eye! But, sadly I was too full from my pork belly and the Lucky's Cafe mac n' cheese (a must-have at this event). The people-watching and other event activities are always fun too, including this carved watermelon display outside of Tandul. Just as we were about to visit our friends at Tremont Scoops, I started to not feel well. Turns out I have sun poisoning on my leg. Whoops! Too much summer fun lately, and not enough sunblock. Shame on me. I know better. Phew, I told you that this weekend was packed full of fun and summer activities. How come when we go out on Friday night the weekend suddenly feels so much longer? I feel like we did, saw, and ate a lot of good stuff this weekend. How was yours? It's been a little quiet over here, because Mr. H and I were spending 9 glorious days on Lake Ontario with my family. It was a much needed break from "reality" and always good for the soul. It was full of fun in the sun, playtime in the water, and of course...good food. This included meals both at my parents' house and out in the area. We kicked it off with some cowboy steaks over the backyard fire pit that I helped build many years ago. The trip included a brief overnight for Mr. H and I at a nearby resort on the St. Lawrence River with stunning views and a balcony suite that provided us with a gorgeous backdrop for 4th of July fireworks. We experienced fine-dining at its best when service, food quality, and setting all come together perfectly. Thank you, Chateau at Saint Lawrence Spirits! We ended the extended week with smoked brisket from my brother and fresh-cut fries from Mr. H.
Back to reality this week, but I'll still be thinking of summer bonfires, sunsets, puppy cuddles, boat rides, and the amazing meals we had. Hope you all had a happy holiday weekend (or week, in our case) as well! I've had a long three weeks of work, including two trips out of town and three weekends in a row of working. Mr. H was being extra thoughtful and planned a date night out last Saturday to check out the newly opened Collision Bend Brewing Company in The Flats. We had a reservation, and when we arrived the list was 15 parties ahead of us to be seated on the outdoor patio on the river. Of course, because it's stunning out there! We decided to go ahead and sit inside, but our table was along the floor-to-ceiling windows, so you almost felt like you were outside. We both wanted to order a flight to check out their beers. I ordered the Iron Wind Pilsner, Old River Kolsch, a wheat beer not listed on their website, and the Samsel Stout. The stout was the only one I didn't care for. For my personal taste, it was too hoppy. The others were all easy-sipping beers, but they weren't memorable. One that I would absolutely order again is the High Rent Lemon Girl that Mr. H had. We also ordered four small plates to share. One issue right away was that the first two plates of food arrived before our beers did. Within just a couple of minutes of being seated and placing our order. The flights quickly followed, but then immediately so did the second round of small plates. Suddenly, we had a tiny table full of food and hadn't even really gotten into tasting our beers yet. The timing was awful, and I did bring it up to our server. The message feels like "We don't care about your experience, and we're just trying to turn this table as quickly as possible." I'm not trying to settle in for the night and take up a table forever, but we were in and out in under 40 minutes and felt very rushed. Not pleasurable at all. Issues are always worth bringing up with your server or management at any restaurant, but particularly at a newly opened one. They can't improve or address specific issues if you don't bring it to their attention. So, let's talk about the food. Thanks to social media, I've seen a lot of people raving about the Giant Molten Meatball stuffed with cheese and served with marinara sauce ($8). It was certainly a solid dish and we enjoyed it just fine, but it did sound better than it actually was. As did the Asian Style Arancini Siciliana ($6) with fried risotto balls flavored with pickled ginger, Asian aromatics and served with wasabi mayo. Probably my favorite of the four, but still not quite hitting the mark for me. We also shared the Moroccan Lamb Ribs ($14). They were fried and served with cucumber-yogurt sauce and pickled vegetable. The rub was flavorful, but the meat was hard to get off the bone and the sauce was a bit too runny to really stick to the meat. I've also seen a lot of positive chatter about the Roasted Brussels Sprouts ($8) with Vietnamese caramel sauce, queso fresco cheese and shishito peppers. These actually probably would have been good, had they been cooked through. They were under cooked, so still pretty hard and bitter. We left most of them behind. Absolutely some of these issues are opening kinks to work out. The food selections and quality were still much better than anything most breweries are offering, but I think my expectations are higher when it's coming from the Zack Bruell Restaurant Group. The location, vibe, and views are fantastic, so I do hope it continues to improve as they get more time under their belt. I'd love to head back for a pizza and beer out on the patio. If you've been, what are your thoughts? A from-scratch Eastern European delicatessen and bakery featuring koji cured meats, wild foraged ingredients, and local fermented foods, called Larder: A Curated Delicatessen & Bakery, is trying to open its doors in the Hingetown area of Cleveland. They are running a Kickstarter campaign through Saturday, July 8th, and there are some great rewards for backing the campaign. I have my eye on the 2-hour foraging class! Give it a look here, learn more about their background and intentions with this shop, and consider supporting them. There isn't anything quite like it, and personally, I'm looking forward to seeing this come to life.